We are off to Scotland tonight- I am hoping to get to Edinburgh parkrun, but I have seen that there are road closures because of the marathon and other races, so who knows. 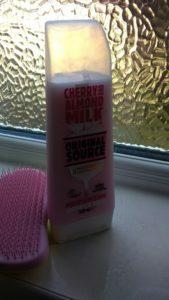 This shower gel is amazing- cherry and almond milk and basically smells of marzipan. Winner. Ages ago (Easter…) I ordered a selection of these chia charge bars (some are flapjacks, some are nakd style bars). 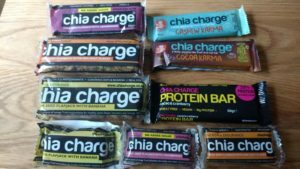 The chia charge cocoa karma bar is amazing- more like the Lara Bars you get in the US. I shall be ordering some more when I get around to it. We have been seed-sitting (looking after some seedlings for Andy’s parents while they are on holiday). 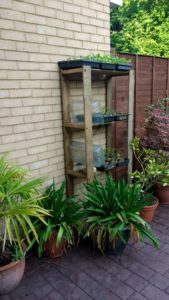 The fox cubs had been enjoying getting a few of the little pots each night and flinging them across the patio, so we got an old shelving unit from the shed and put them up there- it seems to have worked so far! I want to paint our fence (green I think) but I am a bit worried that the paint will drip through to next door. 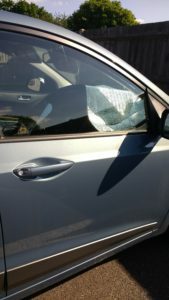 I’ve got a sun shade for my car to keep the steering wheel from being boiling hot. But it really only fit my old car (I only remember this on those hottest days)- on Thursday after a boiling hot day at work, this greeted me! I think I need to invest in a bigger one! Monday- pop to see Mum and Dad after work (sit in their garden), come home and finish up work, have dinner, do some weeding in the garden, then make pb blondies for work- a very jam-packed day. Tuesday- OH run to the lakes and back. Wore a t-shirt and should have worn a vest. It’s way too hot now for t-shirts, what was I thinking? Wednesday- Yoga- lovely session focusing on breathing. I managed for the first time ever to do the top bit of the pairs downward dog thing, although I did fall off on my first attempt and ended up with a mini egg lump and bruise on my knee (I iced it once I got home). Very pleased that I managed it though. 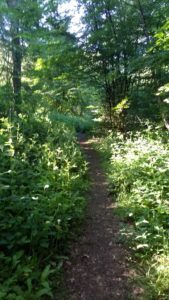 Thursday- a run looking for shade, although some of the paths I took through the woods turned out to be way too narrow and full of stinging nettles and brambles. After we get back from Scotland I have a few bits planned, including doing the London 10 Mile race on the Sunday. Entries close at midnight on the 1st June so if you fancy it, make sure you sign up asap! Do you like 10 mile races? Do you think I could paint the fence? Any Bank Holiday plans? 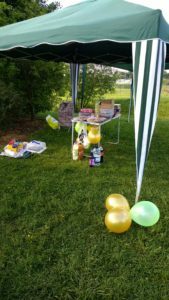 This Saturday it was the first birthday of Ellenbrook Fields parkrun so it was time for some celebrating. But first- the week leading up to it: I had a sore throat on Sunday and Monday, so on Tuesday I did a little run/walk on my own instead of going to the club run. On Wednesday I sneezed a few times and wondered if a cold was on the way, although yoga seemed to help as it was a very calming session (and nothing came of the sneezing). I did another short run on Thursday which was fine, but by Friday I was sneezing lots and had very sore sinuses. I didn’t want to miss out on the birthday celebrations so I told myself I could keep the tail runner company if I felt bad still. 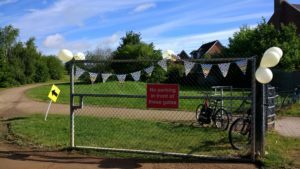 Even though the weather that week had been total pants, the sun shone on Saturday morning and someone had gone around putting balloons and bunting up. They had asked for cakes, so on m way home from work one day I stopped to get some baking supplies and made a tea-bread and then a raspberry and almond tray bake- basically the raspberry cake from the CCC book, with ground almonds subbed for some of the flour, and then topped with white chocolate and flaked almonds. Loads of people turned up! They were trialling a pacer event and I think had pacers from 22 to 32 minutes. Dennis and Eleanor Draper (our “local celebrities”- they were the oldest couple to run the London marathon this year, and have been interviewed on MT before) set everyone off. I actually felt loads better on Saturday morning, but was being very sensible. 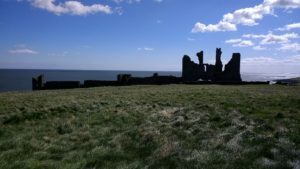 I started near the back but actually felt OK (after having an early night and having a mixture of peppermint, lavender and tea tree oil to help with breathing)- I stopped to take some photos as it was gorgeous out there. I always love the end of the first little loop as all of the timers and RD’s and funnel managers etc. are all there to give you a little cheer as you go past. 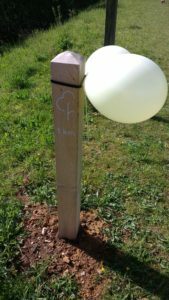 Even the km markers had balloons! I ended up running with a friend who was being the 32 minute pacer (although I think I distracted her somewhat as near the end she realised she was going a bit too fast- I ended up just over 31 minutes). It was very enjoyable and I felt fine when I finished. There was still plenty of cake when I finished, although all the raspberry and almond cake had gone. I had a little piece of lemon cake and then hung about cheering everyone else in and chatting to lots of people in the club. The rest of Saturday was fairly boring (school work with a little walk into town to break things up), but our fox cubs did visit our garden on Saturday evening- around 9.30 pm each night now they seem to come and are hilarious- chasing each other about, jumping in the bushes and hanging from the branches by their teeth. On Sunday I didn’t set an alarm, and so didn’t head out on my run until gone 9am. It was warm but with a breeze so actually fairly nice for running. I had decided to add on some distance to my run from last week (I did 7 and I wanted to do 10 this week), although I thought going further would add on 3 miles but it only seemed to add on about a mile and a half. I could have run past home and gone on a bit, but I was so thirsty by that point that I decided 9 miles was enough. After more work (and spending ages getting very annoyed emailing my MP and the other local candidates about education, fox hunting -I am very against this and do not want to see it voted back in again- and how they will support the rights of EU citizens) my brain was frazzled so I headed out into the garden for some pottering. 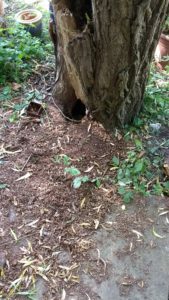 I found that the fox cubs had been digging a hole under the willow tree so I filled it in and put a stone in the way- I don’t mind them digging but I don’t want the tree to become unstable. 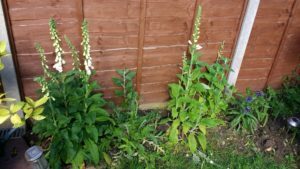 The fox gloves are starting to flower too! (This post is very fox-heavy it seems!). This is the only patch of garden that I have added plants to as we are going to plan it all out properly. There are cornflowers and poppies there too. I felt so much better after that- just an hour or so of pottering around lifted my mood. The weeks are flying by! 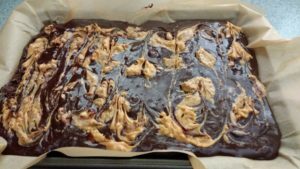 So here is a random catch up of thoughts (which turns out to be a lot of baking). 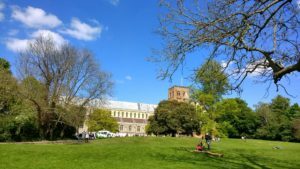 St Albans Abbey in the sunshine. Weeks ago we had parked outside St Albans and then walked into town via a flooring shop to look at some samples. We were going to visit The Pudding Stop but it was very busy so we got a takeaway instead (peanut butter salted caramel brownie..). 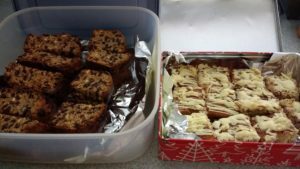 I have their recipe book so I decided to make them for work the next week- they went down very well. Although in the recipe book you add the caramel in the middle, with more batter on top, but I think next time I would just put the caramel on the top with the pb. 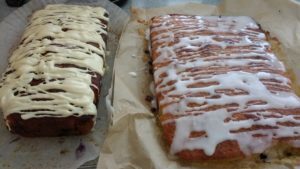 Last week I made a raspberry and white chocolate loaf cake, and it was very well received. This week I used the same recipe but made it into a lemon and blueberry cake instead. I doubled the mixture and made a tray bake for work, topped with a little lemon icing, and then a loaf cake to take around to Sunday tea, with the rest of the white chocolate melted and poured on the top. The loaf needed longer to bake, hence the more browned appearance! I have been sent some products for dry and sensitive skin, including some lovely What Skin Needs soothing skin gel (which is good for wind burn- I have not tried it yet as it hasn’t been as cold, but I do have a problem with this after a long run in the cold so I know it will be useful), and skin balm (I love this stuff). It contains plantolin, which (from their press release) “is a patent-protected active plant extract, scientifically proven to soothe, renew and protect. This key ingredient is derived from the Australian indigenous plant, centipeda cunninghamii, and is internationally patent protected for its novel active compounds that provide a natural synergy of anti-inflammatory and anti-oxidant activity. Plantolin extract is used in Australia on wounds to speed up the healing process and stimulate tissues regeneration“. It also smells lovely (it contains lavender and geranium oil which I love as a combination (we had that on our foreheads at the end of yoga last week). 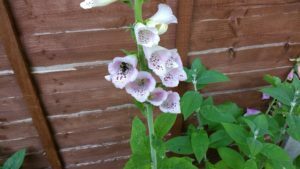 I do get dry and itchy skin, and I have trouble finding creams as body butters tend to feel too greasy and thick, some very scented ones irritate my skin, and others don’t seem to sink in very well. Before this one I was using a Body Shop almond milk and honey one, and this one works just as well. 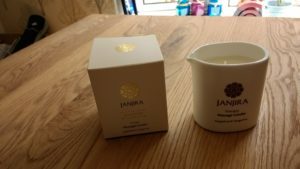 It turns out you can use the melted candle wax as a moisturiser- it has a pouring lip at one end, so once a bit of the wax has melted, you blow out the candle and then pour carefully onto your skin. I haven’t been brave enough to try that yet, but the candle does smell lovely- a fresh citrus smell which is perfect for spring (grapefruit and tangerine). I’ve had a real mixture of running recently. As I haven’t been training for anything specific (eg the Wings for Life was just run as far as I fancied) I’ve just been going out as far as I would like. Last Tuesday our running club started the tradition of the 8 (and a bit) mile route on country roads and paths around Essendon- a tiny village near Hatfield. We only do it once a month in the summer, when it’s light enough to finish before it gets dark, as we have to cross a dual carriageway, and some of it is on country roads. We usually do around 4-6 miles on a Tuesday, so to push it up to 8 always sounds hard, plus this route has some big hills, but it’s so satisfying once it is done. 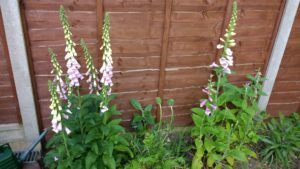 I skipped a run on Thursday in favour of going to the cinema- we went to see Guardians of the Galaxy 2- I thought it was quite fun, and I am not usually into the comic book films. The end did drag on a bit though, and I lost patience with the extra bits in the credits, so we left after the third one! Last Sunday I didn’t set an alarm, and I’d been out for a meal the night before so had a fairly late night (for me- midnight! )- I decided to run to the lakes and back, but when I got there the route I usually take was cordoned off. It said helicopters were using the area so I was taking no risks! There was some sort of car show going on, so I had to run up a hill, along the top and back down again before getting to the lake. I had no idea how long the run would be- I guessed around 6 miles, but it turned out to be just over 7. I think 7-10 miles is a good Sunday morning Goldilocks run- not too short, not too long. The day before my birthday (weeks ago now) we went out for brunch at Bill’s- my favourite place for brunch (or sweet potato fries! 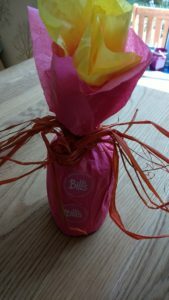 )- I have been using the app to pay for the last few visits (you link it up to paypal or a credit card) and I had enough stamps for a jar of jam- they wrapped it up so beautifully too. 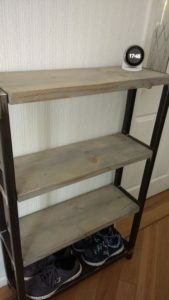 A while ago we ordered a new shelving unit from St Albans Wood Recyling co. – they use recycled wood to make bespoke furniture. 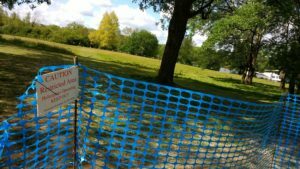 (A side point- this is a bit like parkrun for wood as it is a not-for-profit, run by volunteers and works to support people getting back into employment). We’d been for a look around their “ideas hub” (a sort of show- room, but it more shows things they could make with the wood, and then you give them the exact specifications and they do a quote) and seen something similar that we liked, so they made one to fit perfectly between the dining room and living room doors. The bottom shelf is a metal grid so it can be used to store shoes. I just need to actually put some books or something on it- the thermostat is a little lonely! Do you have many loyalty cards? I feel like I have so many (I even have one for the Montezuma’s shop in Brighton- even with 3 visits a year it will take me a long time to earn a free bag of truffles!). I do quite like having it on the app but then if I can’t get internet (or remember my password…) it’s more complicated. Have you been to the cinema lately? I still haven’t seen Beauty and the Beast, but as the cartoon is not my favourite Disney film I haven’t been that bothered. We did watch Moana last Friday as I was given the film for my birthday- that’s more like it! What sort of distance do you like to run? I do prefer a slightly longer run (because I would rather run slower but for a bit further than have a short and gasping for breath run), but up to half marathon is long enough I think. 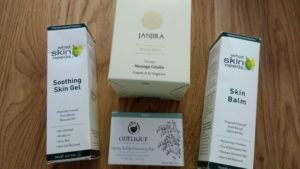 *I was sent the sensitive skin products in exchange for a mention on my blog. All opinions are my own. I love a road trip. We have had some brilliant ones over the years, and this Easter was no exception (and no long haul flights either). When we have a long drive we load up the podcasts and head on out. This time we had classics like Wittertainment/ Kermode and Mayo’s film review (BBC Radio 5’s film podcast), Pop Culture Happy Hour (they discuss TV, films, books, music), and More or Less (from Radio 4 -they look at numbers in the news and discuss how factually accurate they are). A few years ago we loved listening to Serial (although later the series 2 wasn’t quite as gripping as we weren’t aware of the story- whereas it had been big news in the US)- they had made a new podcast called S-Town so we listened to all of that. It was released in one go, like Netflix do, so you could listen to one after another instead of having to wait a week. It was a very interesting story, and it kept going in different directions. If you have listened to it, the Here’s The Thing podcast (hosted by Alec Baldwin) had the presenter Brian Reed on it, and that’s worth a listen too. I’d seen on Joy the Baker blog a recommendation of The Accused, a podcast by the Cincinatti Enquirer newspaper, where a journalist investigates an unsolved murder from the 1970’s. Very well done and very interesting- this reminded me more of the first season of Serial. We started to listen to the BBC podcast Murder in the Lucky Holiday Hotel, but I found the first one very complicated (not helped by having a complicated journey that day with lots of sat-nav directions). I think I need to start it again and listen from the beginning, but on first impressions it wasn’t as well put together as the US ones. Some of these are very serious, so when we needed something more light-hearted, the Adam Buxton podcast was brilliant for that. I have mentioned it before, but I used to love the Adam and Joe show when I used to babysit, and then I loved their radio show and podcast. Adam Buxton on his own is different (obviously)- still the same funny jingles, but he intereviews a different person each week. Sometimes I have heard of them (Louis Theroux, Zadie Smith), other times I haven’t (Mark Maron) but they are all so interesting. One of my favourites was an old one with Michael Palin, but they have all been great in different ways. We didn’t have time for any others, but I did hear an advert for the second season of Someone Knows Something (a Canadian podcast investigating the disappearance of a 5 year old child in the 1970’s)- so I shall have to add that to our list of road trip podcasts- we are off to Scotland in a couple of weeks so maybe we will get around to it then. Which podcasts do you like to listen to? Any recommendations for me? When do you listen to them? 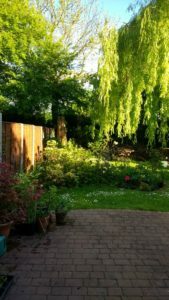 I listen to some when running, some when I drive to work, and some when I am just pottering around the house, baking or gardening. I don’t tend to listen to them when I work as I can’t concentrate on them. We also listen to ones we both like at dinner, and in the car. Rickmansworth parkrun only started in March this year, but it is regularly attracting 300+ runners each week. Since I heard about it (I think at the parkrun volunteer celebration evening) it’s been on my list, and Dad quite fancied it too, so we had penciled in this Saturday as a date we could both do. Although it’s in Hertfordshire, it’s around the M25 a bit (I don’t think I have ever been there before, I’ve just seen it on signs when I am coming back from Heathrow etc.). As it was on my way I would be picking up Dad, and we aimed for around an 8am pickup, as google thought it was 25-35 minutes away. It was raining slightly when I left, which I wasn’t expecting, but thankfully it stopped as I drove over. 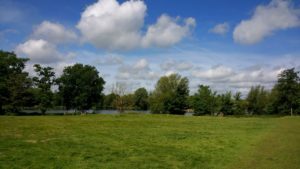 The satnav on the course page took us right to the car park at the Rickmansworth Aquadrome, which is where the event takes place. 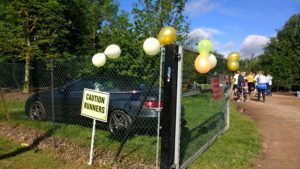 We arrived at around 8.40am, and despite there being loads of runners, the (free) car park had plenty of space. The meeting point was right next to the car park- very easy to find, and also handily next to a cafe and toilets. It was a bit chilly and we both regretted not waiting in the car for a bit longer. (From their facebook page). We didn’t use the cafe as we wanted to get back to see Mum, but lots of people did, and how fantastic that they raise money for charity. We ended up chatting to two tourists from Longrun Meadows- we commented that it sounded like a lovely place, and it turned out to be in Devon. They asked us where Panshanger was, as they had family close by so tried to visit a different one each time they were up here. 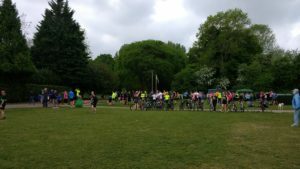 A lot of parkruns take the name of the town or city (St Albans, Rickmansworth, Tring) but then so many of them are more specific to the park or the area, so you have no idea where they are from without looking it up. At around 5 to 9 we were lead to the start, which was a bit further back along the path. Everyone turned and faced the way we had come so we worked our way back a bit. With 375 runners it did feel a bit congested at the start- we had started a little bit too far back and spent the first mile trying to overtake people as the paths widened. We ran a fairly comfortable pace because of this, and managed a good chat. Dad had been away on a cycling holiday in Croatia, Montenegro and somewhere else, so I enjoyed hearing about it. We also enjoyed the scenery- especially on the second lap when we didn’t have to be constantly looking for gaps between people. He’d said to me that if he felt good he quite fancied pushing it for the second lap. After a mile or so, it did feel less crowded and we picked up the pace a bit, but at the second mile I told him to go ahead if he fancied it as I didn’t think I could go much faster (I had 8 children off in my class on the Friday due to stomach bugs, and I had been up a bit in the night with stomach pains- all fine but I didn’t want to push it too hard). I did nearly keep him in sight (it’s fairly twisty so often you couldn’t see that much further ahead), and I felt like I slowed towards the finish- I was steadily overtaking people during the run, but in the last little bit a few people overtook me. In fact when I looked on Strava it was a royal flush negative split- 9.45, 8.52, 8.49, 8.11. I was dripping in sweat when I finished! It was turning into a fairly warm day, an despite it being overcast at the start, it was quite sunny. I finished in position 158 with a time of 28.43, Dad had managed to finish 21 places ahead of me in 27.42. I double checked later but that was my 19th UK course too- nearly there! We watched the runners come in thick and fast, and attempted a selfie in front of the cafe to commemorate the tourism. The parkrun was really enjoyable- I liked running around the lake and through the woods, and because it was only two laps I didn’t get lapped at all. It is a busy one though, so if I was to revisit aiming for a pb I would start a bit further up if I could. It’s so hard to judge though. The good thing about going to a lapped course for the first time of course, is that you get a “PR” and a second place on all the Strava segments! After driving home, Mum made us pancakes with blueberries and mango- delicious, and a great start to the weekend. 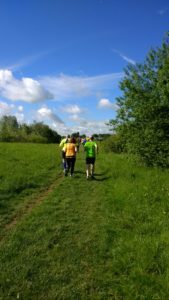 There are still two Hertfordshire parkruns that we have not been to (Cassiobury and South Oxhey, both around the Watford area) so we need to visit them at some point. There’s another St Albans one starting around August too- the list keeps getting longer! How many parkruns are local to you, or in your county? 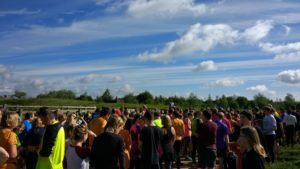 Have you visited all of the parkruns in your county? Do you tend to always do the same one or switch between ones that are close by?